Welcome to the Jet10 tuning. This is the copedant I play on my 14 string, or I should say the top 10 strings on my 14 String. I call it the Jet10 because the core tuning was developed by Julian Tharpe, with additions I have made. I believe this tuning to be the best alternative to the Universal 12 Tuning. 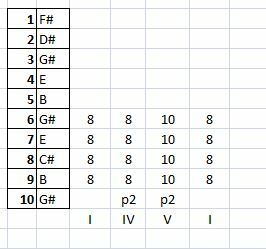 The other advantage with this tuning is when you go into the 6th mode you don't have to move the bar, strings 10,9,8,7,6 is the grouping that makes up the 6th mode. In the example above you get the I6th chord, the 4 chord by hitting pedal 2, slide over to the tenth fret with the pedal 2 pushed down you then get the 5th chord and then slide back to the 8th chord.